Albas are not actually a single rose but rather a class of hybrid roses whose origins are unknown but are believed to date back to prior to the Roman Empire. Many botanists believe the rose Alba is mentioned in text written around 25-70 A.D. It is believed that Albas are the offspring of a breeding between the Rosa damascene (Damask rose) and the Rosa canina (Dog rose). While their true origins may never be known, there are a little over a dozen different varieties in this class of roses. Alba roses are shrub roses that only bloom once in the spring time and they produce exquisite blooms in either white or shades of soft pink. They have a strong fragrance, most likely a trait given to them by their damask parent, and one can detect hints of citrus in the scent. The rose Alba is a very hardy plant and for the most part is resistant to many diseases and can also tolerate growing conditions that many other roses can't handle, such as drought, shade, and even some colder winter temperatures. This makes them very versatile plants that you could work into any of your landscaping ideas. There are a number of varieties of roses that fall into the Alba class. Some of them you have probably already heard of such as the Plantier, or the Celestial. Also in this clase are the Maiden's Blush, Parmentier, Legras de St Germain, Konigin von Danemark, Amelia, Blush Hip, Chloris, and Suaveolens. Perhaps one of the most notable rose Alba is the Maxima. Most Alba roses tend to remain fairly compact roses with the average height being around 6 feet or so. A few varieties will grow taller and a few will remain a little shorter. 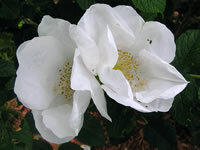 You will often find the rose Alba in an old English garden with other rose varieties that have a long, rich history. Their intoxicating fragrances earn them a deserving spot in just about any garden one wishes to plant them in. Once established, your Albas should give you countless years of wonderful blooms with proper care and you will be hard pressed to find someone who is not impressed with the grandeur of these roses. The most important decision you will make in the life of your rose Alba is where you decide to grow it in your garden. While most Albas are tolerant of partial shade, roses just don't perform as well in these spots as they would in direct sun light. If you have the perfect spot for your rose and it happens to be a somewhat shady spot, by all means use it. However if you want the best and the most blooms you can get, you should find a spot that gets a minimum of 6 to 8 hours each day of direct sun light. Alba roses only bloom once in a given season so you might as well make the most of it! You also should make sure that the spot you've selected has soil that drains well. Roses in general tend to do poorly if they stay soggy for long periods of time. Read the next section on planting your rose Alba for an easy way to amend your garden soil. Planting your rose Alba is very easy and you won't need any special tools to get the job done. Before you begin however, I do suggest making sure that you have some organic compost handy. You can pick up a bag at your local garden center and they are usually inexpensive. If you got your rose from an online nursery then you most likely received it as a bareroot plant and you will need to soak it overnight in a bucket. See our article on Planting Bare Root Roses for more detailed information. You will want to dig your hole for a bareroot plant wide enough to accommodate the roots without having to force them around the hole. You also should dig it deep enough so that you can mound up some soil in the center of the hole and maintain a depth for the bud union at around an inch or two below the surface of the soil. If you got your Alba roses locally, then they almost certainly came in a container and for those I usually dig a hole about twice the diameter and the same depth as the container they came in. Now before you set your rose Alba into place, take your organic compost and mix it with the freshly dug up soil at a ratio of 2 parts soil to 1 part compost. This will give your roses that extra boost to help get them established. Once you have your rose set in the hole at the proper depth, back fill the hole about halfway to start, then water the soil heavily until it is almost like mud. Back fill it the rest of the way and then water it thoroughly once more. This will help settle the loose soil around the roots and will help prevent air pockets from forming. You will need to make sure that you give your roses proper water without overdoing it. A good rule of thumb is one deep watering every week, however if you live in a more arid or hot climate, you may have to step that schedule up a bit. You can also give your rose Alba fertilizer in the early spring when the leaves begin to develop. Since these are not repeat bloomers, there really isn't much reason to feed them again later in the season like other roses, but you can if you like. Pruning your Albas is fairly easy, start off by removing all the dead and diseased canes, and any lateral canes that are overlapping one another. Then cut back the remaining canes to about one third of their original height. This is also a good time to clean up any leaves and debris that may be lying around the base of your plant as this could be a breeding ground for pests and diseases.